With the recent updates to the Mac systems, there has risen some compatibility issues with different versions of iPhoto and Photos (the replacement of iPhoto). This, coupled with the growing size of pictures is a good reason to switch to Google Photos. Google Photos gives you unlimited space online to store and manage your photos. To get started, go to https://photos.google.com and sign in with your school account. The first time you upload a picture it will ask if you want to use unlimited storage or full resolution photos. Since Google gives teachers unlimited space, you can select full resolution photos and store all of your pictures in full resolution. To upload photos, drag and drop them onto the Google Photos webpage and they will upload. If you want to upload from your mobile device (smartphone or tablet), install the Google Photos application and you can then upload directly from your device without having to mess with wires. 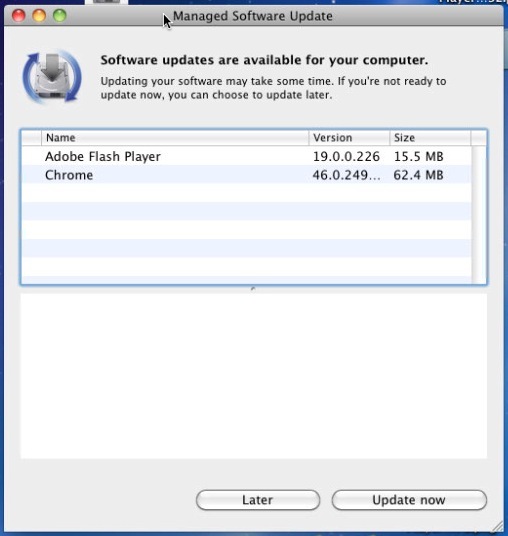 The Macs will update at the login screen, or if Managed Software Update pops up, you can install the updates from the software. Please check your Personal Info page on your MyCatPage to see if you have the correct buildings listed beside your building info. If not, click the link to edit personal info and check the building(s) to which you are assigned. The building listservs are created from this information. Look out, there’s a new tablet in town and it’s HOT! Amazon announced a few new Kindles today, the most important, in my mind, is the Kindle Fire. It is a 7″ tablet running a specialized version of Android. The shocker was the price, $199. With todays announcement, every school district that is looking at mobile devices will need to take a pause and examine what the Fire has to offer. At that price point, it undercuts the iPod Touch by $30. It also sacrifices a camera and microphone. But it makes up for those deficiencies by offering a larger and better display. The main problem with the Fire would be the lack of applications for the educational market. Of course you have access to all the Kindle books, and the explicitly list full color children’s books for it, so it may be just a matter of time before educational software takes off on it. In our iOS pilot programs with iPod Touches and iPads it has become pretty clear that it is hard to convince teachers that the small screen of the iPod Touch can still be used for content creation. The students, I’ve noticed, don’t mind using the iPod Touch, so for them, size doesn’t matter. When it comes to content such as PDFs and books, the larger screen size would be very advantageous. Theft is also an issue in school, but the larger size of the Fire may be a deterrent. The Fire would also be able to be used by more than one student at a time due to it’s size. I’m going to try to hold off any further mobile purchases until the Fire is released and I get a chance to use one. I could see it replacing a lot of iPod Touches this Christmas, it will be interesting to see what Apple has in store on October 4th. If the applications come, the Fire will be a very compelling device for school districts. What devices are you investigating for use in your classroom or district? Although the built-in editor for WordPress works pretty well, it still feels a little bit kludgy. If I’m on my MacBook I like to use Windows Live Writer or Textmate, but Windows Live Writer requires me to fire up VMware and Textmate seems to also be a little kludgy. I’ve looked at the ScribeFire Firefox extension in the past, when it was Performancing, but the latest version seems to be almost perfect. What I’ve always wanted is to not only post drafts to my blog, but to also edit the drafts. The latest version of ScribeFire not only allows me to save my drafts, but I can then re-edit those drafts from ScribeFire or from WordPress itself. For pictures you can either select a picture on your computer and it will automatically upload it or you can do a Flickr search.